In 1505 AD, the Ming Dynasty emperor Zhengde succeeded his father as the emperor of China. Zhengde was only thirteen years old when his father died, and older men did most of the ruling. These men continued to build connections between China and the rest of the world. 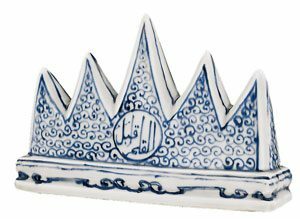 Many Muslim officials from the old Mongol Empire found new jobs with the Chinese government, and many people built mosques in China. China began to see more Europeans, too. In 1506, Portuguese explorers (including Christopher Columbus’ cousin) reached southern China by boat and did some trading there. In 1513, King Manuel I of Portugal sent official messages to Zhengde. Zhengde died in 1521 AD, when he was thirty years old. Zhengde’s cousin, Jiajing, became the new Emperor, but he didn’t have any power either, and his advisor Yan Song ruled in his name. Later Yan Song was able to pass power to his own son, Yan Shifan. Yan Song and Yan Shifan had to fight off Mongol invasions from the north. They tried to keep Chinese traders from trading with Japan, but people just broke the law and traded anyway; this led to trouble with pirates in the Pacific Ocean. Because Ming Dynasty rulers thought that all traders on the Pacific Ocean were pretty much pirates, they also banned Portuguese traders. Like the Japanese traders, the Portuguese traders continued to trade illegally, as pirates. When Jiajing died in 1567, his son Longqing became the emperor. Longqing tried to get power back into his own hands, firing many of his father’s ministers and choosing new ones, but soon he realized that he couldn’t really get power. 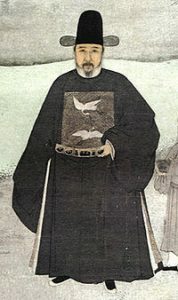 During Longqing’s reign, the government was run by Zhang Juzheng. Longqing died after only six years in power, and the next emperor was Longqing’s son Wanli, who was only nine years old. Of course Zhang Juzheng kept on running the government. Zhang Juzheng did a good job. But when Zhang Juzheng died, in 1582, Wanli was 19 years old, and, like his father, he tried to get power back for himself. For a few years, Wanli succeeded. He fought off the Mongols. But by 1600, he too had lost power to his advisors. In the early 1600s, Wanli’s army got smaller and weaker, while the Jurchens got stronger and stronger. In 1620, Wanli died and his son Taichang took over. Taichang tried right away to make himself popular by giving lots of silver to the soldiers and cutting taxes on the people, even though really China wasn’t rich at this time and couldn’t afford to have less money. But Taichang died of dysentery a month later, so Taichang’s son Tianqi became the emperor. Tianqi was only fifteen years old, so of course he wasn’t the one to get back power for the Ming Emperors, and he didn’t. Tianqi’s chief adviser, Wei Zhonxian, and the woman who had been his wetnurse, Ke, took control. The Ming Dynasty continued to lose power, and people began to revolt against the government. When Tianqi died in 1627, he was still only 22 years old. His younger brother, Chongzhen, became the emperor at 17, and immediately killed Wei and Ke, trying to get power for himself. But the Manchus kept invading and the Chinese people kept revolting. The weak Ming army could not fight both threats at the same time. Finally in 1644, one of the rebel commanders captured Beijing. The emperor Chongzhen killed himself and his family. But less than a year later Beijing fell to the Manchu army. Their leader set himself up as Shunzhi, the first emperor of the Qing Dynasty. Cite this page: Carr, K.E. Ming Dynasty – Later history of China. Quatr.us Study Guides, June 4, 2017. Web. April 23, 2019.